Marguerita McManus has done it again! She, along with her daughter, Sarah Raffuse, brought us Crazy Shortcut Quilts, which revolutionized how many quilters (both experienced and novice) approached their projects. Now, Marguerita writes solo to help expand the options for those U.F.O.s (Un-Finished Objects) and Ph.D.s (Projects Half Done) that we quilters tend to accumulate over a few decades years. One of the things that I most appreciate about Marguerita’s approach is that she takes the stress out of determining what the best “next step” will be if we choose to finish one of those projects. And, of course, finished is far better than perfect in her eyes. It’s a liberating approach. In Crazy Shortcut Quilts, we learned how to take fat quarters and make beautiful crazy quilt blocks. In Finish Almost Any Quilt, we begin to evaluate projects to see if we can adapt some of the quilting and sashing methods from the earlier book to make them more likely to be finished. These joining techniques can be used with any square or rectangular sets and opens up a world of options for finishing quilts more quickly and with confidence on any basic home sewing machine. I found that I was much more confident working a 2 inch diagnonal grid pattern on a modern block for a forthcoming gift project than I ever have been trying to work with a large quilt as a single unit. After following the tips and tricks (including some good ol’ liquid starch) in this book, my machine quilting has never looked better either. I find hand quilting soothing and therapeutic, however, sometimes I find it quite a relief to finish a gift faster and with higher quality machine stitching than what I formerly was capable of doing on my machine. There is no way I could finish many gift items if I were to hand quilt them all. I will still hand quilt the occasional heirloom style project, but sometimes (especially for children’s and charity quilts, where they could be handled roughly) the thrill of a finished machine quilted project is the ticket. Instead of being horrified and frustrated by the results that I was getting trying to wrestle a large quilt through the throat of a small domestic sewing machine, I am able to progress through a learning curve that will allow me to complete more quilts. Better yet, I can be proud of what I produce. It won’t appear “second rate.” And, I can maintain control of my art from fabric selection to binding. I am in love with this technique! 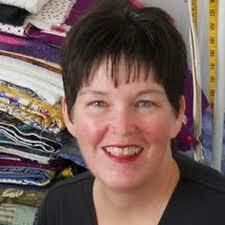 Are you a hand or machine quilter? 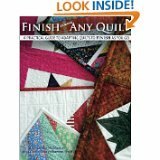 | Book Review for Quilters-Finish Almost Any Quilt” ended up being perfect!